Sagittarius and Cancer are very different in character, temperament and outlook. Their elements — fire and water, in the astrological world are considered to be opposite. On a large scale, each of them affects each other destructively: an abundance of water will extinguish any flame, and a strong fire will evaporate all moisture without residue. According to the characteristics of these natural forces are as different as the representatives of the zodiac signs that belong to them. Sagittarius is a bright, passionate and charismatic researcher, a restless adventurer, most appreciative of his freedom. 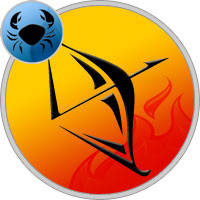 Cancer has external tranquility, tenacity, distrust and subtle spiritual organization. Signs of fire and water differently look at the world: Sagittarius loves life, he is a notorious optimist and prefers not to focus on current difficulties. He is impulsive, constantly in motion — searching for everything new and unusual, which gives him positive emotions and impressions. Cancer is different, almost the opposite. He values ​​calmness, strives for stability. He is often visited by melancholy, in which he is removed from the world and long experiences because of his injustice. Both representatives of the horoscope have a philosophical mindset and periodically fall into a fantasy world. Only the sign of fire tries to understand, with the help of meditation, how everything is arranged, and Cancer is more interested in the question — why. Sagittarius wants to be independent and avoids attachments, enjoying sweet freedom. His partner, on the contrary, seeks a safe haven under the wing of a stronger sign, strives for a complete spiritual merger and mutual dependence. Thus, he is trying to gain a sense of security in this huge and terrible reality. Compatibility of Sagittarius and Cancer is ambiguous: astrologers do not have a clear opinion on this matter. This means that signs, having different characters and ideas about life, can be in a relationship, but extremely difficult for them. Sagittarius is governed by Jupiter — the heavenly body, which gives its wards incredible luck, a desire for knowledge, friendliness and highly developed intelligence. The sign of fire is impatient, unconcerned and loves an active lifestyle. His main life motive is self-improvement, and the karmic task is to transfer the accumulated experience to other signs. Cancer is influenced by the female energy of the Moon, responsible for emotions. As it changes its phases, the emotional state of the water sign also changes often. Abilities of the empathy help him to deeply feel the mood of people. Accepting difficulties too close to the heart, Cancer often suffers, hiding from the evil world in its shell. The horoscope of Sagittarius’s compatibility with Cancer does not promise them a cloudless relationship. From the side it may seem that the active representative of fire in many characteristics is stronger than his partner. But in this union, the sign of the moon appears "from above": his partner is good-natured and self-assured, which plays into the hands of calculating Cancer. He masterfully uses his ability to manipulate feelings and emotions. Sagittarius is ambitious, open and honest — good personal qualities, on which you can advantageously play by subordinating yourself to another. Between the signs there are often situations where the son of Jupiter is guilty before Cancer and feels obligated to him. Moreover, a clever, resourceful and freedom-loving sign of fire does not always understand how he got into such cleverly arranged networks. Compatibility of Sagittarius and Cancer in the work is at a low level, because they have different rhythms of activity and approaches to work. Cancer is slow, getting down to business, it can think about its essence for a long time. Sometimes it falls out of reality and hovers in the clouds. Sagittarius does it all too quickly, so often refers to the work superficially and makes mistakes that are unlikely to recognize. In the work team, he is inclined to criticize others and to dominate, and this is clearly not going to appeal to a touchy and vulnerable partner. Compatibility of Sagittarius with Cancer in friendship also leaves much to be desired. They are too different characters. Their relationship can be described as friendly, where both pursue some benefit from acquaintance. Cancer is jealous of people relevant to him, and Sagittarius has a wide range of contacts and will not sit faithfully next to a friend. Free time they also spend differently: the sign of fire loves drive and bright emotions. The representative of the Moon will prefer to rest in a narrow circle of close people. The compatibility of Sagittarius and Cancer in love is at an average level. Initially, lovers will be fascinated by each other. The sign of water will be liked by an optimistic and open partner, and the latter will be attracted by the sentimentality and good nature of Cancer. The fire sign is inclined to superficial relations: having received from communication the emotions and sensations necessary for it, it easily disappears. But not in this case. The sly representative of the Moon has a subtle intuition and immediately feels for what strings he can pull the lover to hold him. Only in appearance he seems sweet and pliable, but inside of him sits a skillful manipulator, who knows how to get what he wants. And if Cancer strongly adheres to Sagittarius, and he is likely to become attached, he will cling to it with his claws and will not let him just walk away. Compatibility of Sagittarius with Cancer in a relationship is far from ideal. The first wants freedom and avoids responsibility, he should have fun, lead a carefree lifestyle and have a partner who does not require any obligations. It would be an ideal option. But the second is aimed at a strong family in the style of "and they lived happily ever after." He needs a stronger and more active person who can protect, prompt, calm. The representative of the fiery element is partly suitable for this role. But sincere intimacy and sincere trust are unlikely to arise between them because of the fact that Sagittarius is too distant, and his views do not coincide with the aspirations of the partner. Compatibility of Sagittarius and Cancer in bed is unstable. At first, partners, driven by passion, will completely arrange each other. But beyond the lovers waiting for difficulties and misunderstandings, which are associated with different expectations in sexual life. Sagittarius is active and inventive, loves passionate love joys. The lover Cancer will try to please his desires, although he loves more calm, sensual caresses, which sooner or later he will start talking. To maintain a pair and a satisfactory intimate life, the signs of fire and water will have to establish a constructive dialogue in which both will express their fantasies and wishes, and most importantly, they will hear the partner and will meet halfway. This is the only way to preserve their fragile happiness long enough. It’s extremely difficult to achieve good compatibility with Sagittarius in Cancer. New couples are waiting for hard, shaky family relations, over which they will have a long and hard work. This is provided that they are interested in each other and want to be together. However, the likelihood that the tandem will safely last a lifetime is very low. According to statistics, most of these pairs break up due to the fact that they could not get used to it. Sagittarius is a single sign. The main value for him is self-realization in a society that can not be achieved if you are bound by arms and legs by mutual obligations and responsibility. Cancer seeks precisely why his partner tries to escape. In marriage, he controls and keeps the freedom-loving husband in every way, becoming from time to time too intrusive and excessively jealous. Compatibility of Sagittarius and Cancer in family life for a while can be favorable if their plans and dreams of the future coincide. The sign of fire will remain in partnership in two cases: if he experiences deep feelings for the spouse, or the second half is the person who promotes his ideas.